I can’t believe it’s been ten years since I last saw you guys. We really miss you a lot. A day doesn’t go by without thinking of you all. At first it was mostly tears, but now it’s about happier thoughts, all the good times we had. You would be amazed at how all of us pulled together after losing you all. It was hard on everyone, families and friends. We all changed forever, but I like to think that overall, it’s been in a good way. I have to confess that I feel responsible for what happened to you all. I worked a shift in Mission Control for STS-107 the week before you were coming home and learned about the foam strike and the debate about what it might mean. I should have done something. Laurel, after the accident our son Iain asked why you didn’t bail out. He knew you had done a lot of parachute jumps and all the crew had the right equipment and had practiced it before. I told him that you were too high and going too fast and that it probably wouldn’t work out. Then he said he was going to become a scientist and invent a time machine and go back and warn you all. I realized then that I had to focus the rest of my career making it safer for those following in your footsteps. Jonathan Clark, with his wife Laurel and their son Iain. – Photo Courtesy: Jonathan Clark. In discussion with the Columbia spouses we were entirely unified in our desire to ensure that all the lessons learned from this mishap be applied to prevent this type of accident from happening again. We discussed the crew survival section and our desire is to ensure this information is made available to learn all we can from it. A fundamental aspect of every aerospace mishap investigation is the understanding of crew survivability issues and there is much still to learn about survival during upper atmospheric reentry. As sensitive as this issue is, it is essential that the facts related to crew survival be disseminated to ensure the next generation of spacecraft are afforded the maximum protection. This is particularly apparent with the upcoming Orbital Space Plane and future commercial spacecraft. Perhaps the greatest legacy of the Columbia crew will be these enduring lessons applied to future human space endeavors. In 2004 NASA created a follow on group to look at crew survival issues, which was called the Spacecraft Crew Survival Integrated Investigation Team, and I was a member. We looked at all the space mishaps including Columbia, and really came up with a better understanding of how to make it safer for human spaceflight. In 2008 we published our report “Columbia Crew Survival Investigation Report.” I’ve also been involved with the International Association for the Advancement of Space Safety, which was created in 2004, and they are dedicated to making it safer to fly in space. 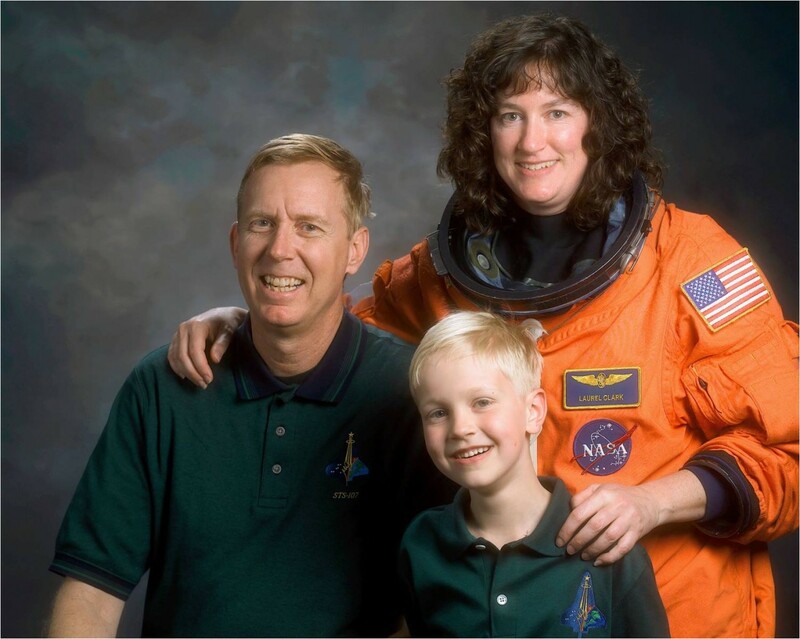 In 2009 I wrote an article “Crew Survival Lessons Learned from the Columbia Mishap” and kept thinking about what our son Iain had said, “Why didn’t the crew bail out from the Shuttle?” Based on what we had learned from the Columbia mishap, the final breakup was below 140,000 feet (42,672m). In 2009 I joined a team that wanted to expand the stratospheric bailout envelope above 100,000 feet (30,480m), which was what the Shuttle Advanced Crew Escape Suit (ACES) was certified to. The mission was called Red Bull Stratos. It was an aggressive flight test program, with many aerospace experts and an international team. We built a pressurized capsule, used a pressure suit based on the Shuttle ACES suit, and used large helium balloons to get to the stratosphere. We tested in the vertical wind tunnel, vacuum chamber, thermal-vacuum chamber, and made many test jumps before setting off to the stratosphere. We learned all we could from the manned stratospheric balloon flights conducted by the United States and Russia in the 1950s and 1960s that supported their impending manned space programs. We studied the US Navy Strato-Lab mission, which tested the Project Mercury pressure suit, the US Air Force Project Excelsior stratospheric parachute jumps, which showed that a jump from 102,800 feet (31,333m) was survivable, and the Russian high altitude balloon parachute program “Volga” which used a pressurized capsule modeled after the Vostok spacecraft. We developed new medical procedures to deal with the hazards of space, like exposure to vacuum. Jonathan Clark talks about his work with Red Bull Stratos in a TEDx Talk. After two unmanned flights to test the balloon systems, in 2012 we flew three manned flights into the stratosphere, and on 14 October 2012, 65 years to the day after Chuck Yeager broke the sound barrier in the X-1, we successfully accomplished the highest stratospheric freefall parachute jump from 128,100 feet (39,045m), achieving human supersonic flight without an aircraft at 837 miles per hour (374.3 meters/second), or Mach 1.27. Sonic booms were heard on the ground from a human breaking the sound barrier in freefall. We never gave up, despite the risk, to show that anything is possible if you believe it can be done. Rick, Willie, Mike, KC, Dave, Laurel, and Ilan we miss you all so much, but it warms our hearts to know that your legacy will endure in making it safer for the next generation of space flyers. Our sorrow and grief will pass, and we will meet up with you on the path ahead. – Dr. Jonathan Clark is an Associate Professor of Neurology and Space Medicine at Baylor College of Medicine and teaches operational space medicine at BCM’s Center for Space Medicine. He was a Member of the NASA Spacecraft Survival Integrated Investigation Team from 2004 to 2007 and Constellation EVA Systems Project Standing Review Board from 2007 to 2010. From 1997 to 2005 he worked at NASA as a Space Shuttle Crew Surgeon. He served 26 years active duty in the US Navy as a Naval Flight Officer, Flight Surgeon, and Military Freefall parachutist. Dr. Clark is Medical Director of the Red Bull Stratos Project. His professional interests focus on the neurological effects of extreme environments and crew survival in space. Space Safety Magazine welcomes guest columns and contributions. Have an article to share? Get in touch!